Aggression inflicts a huge personal, psychological and financial burden on affected individuals, their relatives, and society at large. Despite large scientific, preventive, and treatment investments, no decrease in aggressive behavior is seen. This calls for a shift to new approaches. By capitalising on comprehensive longitudinal cohorts, recent advances in genetic, biological, epidemiological, and clinical fields, and combining such interdisciplinary expertise the ACTION consortium will dissect the etiology and pathogenesis of aggression. Based on new insights, ACTION will inform the development of novel diagnostic tools and causative targets and guide the development of treatment and prevention strategies. ACTION is built on interrelated work packages with a focus on a) clinical epidemiology and current classification and treatment problems; b) genetic epidemiology, including Genome Wide Association studies and epigenetics; c) gene-environment correlation and interaction; d) biomarkers and metabolomics. ACTION will deliver an overarching framework that combines a thorough understanding of pathways leading to aggression with a map of current gaps, best practices on clinical, ethical, legal, and social issues. Based on this framework, ACTION will develop novel biomarkers suitable for large-scale applications in children and combine biomarker data with new insights into the effects of gender, age, and comorbidity. ACTION will provide guidance in optimising current intervention programs and deliver new biological targets to pave the way for novel therapeutic interventions. ACTION will provide a decision tree to guide personalised intervention programmes and will have direct and sustained impact on reducing paediatric aggression. Its overarching aim is to reduce aggression by developing approachesthat take individual differences in genetic and environmental susceptibility into account, thereby leading to better understanding of personalised intervention programs. Main Objective Improve the understanding of the causes of individual differences in aggression among children in order to better inform the development of prevention and treatment strategies. WP2 Clinical epidemiology• to provide an inventory of diagnostics practices, prevention, and therapeutic interventions, and investigate current needs and questions among child psychiatrists, clinicians, and health professionals treating aggression. • to examine societal outcome of childhood aggression later in life by studying longitudinal trajectories in large-scale prospective population-based data. WP3 Genetic epidemiology • to unravel the causes of individual differences in aggression and the associated comorbidities in children and adolescents by disentangling genetic and environmental effects and examining genetic heterogeneity as a function of gender, age, birth cohort, and age at onset. • to identify genetic variants and differentially methylated regions related to differences in aggression by means of genome-wide association (GWA) and genome-wide epigenetic analyses. WP4 Gene-Environment interplay• to develop and apply new methods to study gene-environment correlation and interaction by including measured genes and measured environments in analyses. 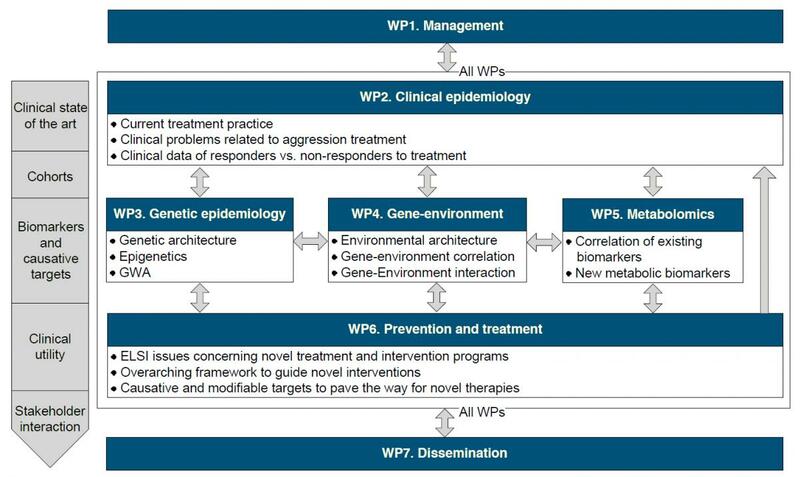 WP5 Metabolomics and biomarkers • to investigate the metabolomic profile (in urine samples) of aggressive behaviour to validate and establish existing and new biomarkers to aid the classification of individuals into different sub-diagnostic categories. WP6 Novel Treatment and prevention strategies • to combine the empirical findings into a comprehensive framework that will enhance our understanding of aggression and its risk indicators. WP7 Dissemination and stakeholder interaction • to translate findings for stakeholders to provide patients and their families with insights into the causes of aggression. The Public deliverables (PU) can be downloaded as soon as available.